Where were you in the spring of 2009? We were there, on the ground floor of the homegrown but “local” Dallas Art Fair. 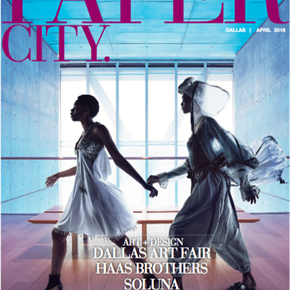 Back then, 30 dealers — a smattering of Dallas gallerists alongside nationals — took over Fashion Industry Gallery, turning the building’s stacked floors and circuitous layout into an antidote to convention- center burnout. A decade later, Dallas Art Fair is all grown up and has spawned a rich month-long banquet of exhibitions, openings, performances, panels, tours, (regulars on the Artnews Top 200 list) as well as insiders and media from New York, L.A., and points in between. Nearly 15,000 attended last year; expect that number to increase this spring. Then there are the dealers. Beyond the American art capitals, you’ll find gallerists headed to Dallas from 30 global cities, including Paris, London, Berlin, L.A., Dubai, Bogota, Hong Kong, Antwerp, Brussels, Cape Town, and Dublin. Dallas Art Fair Preview Benefit Thursday, April 12; Fair Friday through Sunday, April 13 through 15, at Fashion Industry Gallery; tickets dallasartfair.com. Excitement swirls around first-time exhibitors, notably New York’s James Cohan Gallery, home to Texas- based Trenton Doyle Hancock, the two-time Whitney Biennial exhibitor who’s a good bet for any collector; Spencer Finch, known for his evocative work for the National September 11 Memorial; the estate of land artist Robert Smithson; and Chinese-born painter Yun- Fei Ji, who began his career in Texas at Meredith Long & Company in Houston. Jeffrey Deitch protégé Kathy Grayson’s The Hole promises to be anything but tame. Generating the biggest buzz, though, are Manhattan majors Paul Kasmin Gallery and Luhring Augustine, two of the most respected newcomers of 2018. Kasmin’s stable encompasses text master Robert Indiana and the deft photography of Tina Barney; also peruse the paintings of Ian Davenport in advance of the artist’s solo next September at Dallas Contemporary. Luhring Augustine’s roster includes photographer Larry Clark and the pioneering Brazilian Lygia Clark. One of the new exhibitors to watch is Magenta Plains, a NYC dealer with an emphasis on inter-generational exhibitions. Directed by SMU grad Olivia Smith, the gallery plans a smart pairing for its first Dallas outing that will showcase gestural canvases by Zach Bruder and Bill Saylor. From the West Coast, a new-to-the-fair must- see is Shulamit Nazarian, who reps Genevieve Gaignard. Of course, there will be plenty of returning big names, including Perrotin of the global empire (Paris/Hong Kong/New York and headquarters for installationist Daniel Arsham); Hales Gallery, in from London (its fair solo for Frank Bowling in 2015 is still fondly remembered); and blue-chip Allan Stone Projects of NYC. Last year, the Allan Stone booth stocked names from the art-history books. Bring your wallets: A highlight from 2017 at Allan Stone was a Wayne Thiebaud drawing of a slice of lemon meringue pie with a $425,000 price tag — sweet stuff alongside a cache of Cornell boxes.